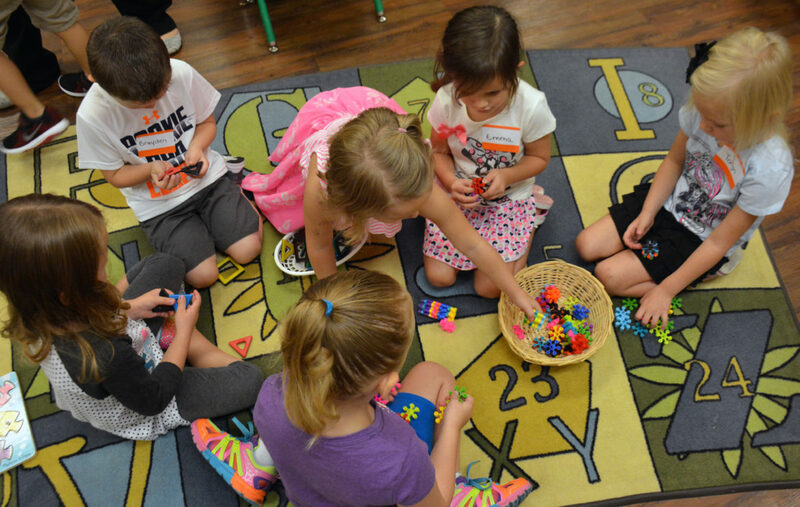 Pre-K students in Broken Arrow Public Schools work on an activity in the classroom. The school district is one of several that is increasing the maximum number of pre-K students per class sizes above 20 students. Small classes are a cornerstone of pre-K, but some districts are now raising a long-held cap on the number of students, a move that could dilute Oklahoma’s most admired and arguably successful educational initiative. Like many other states, Oklahoma limits pre-K classes to 20 students. When there are more than 10 students, the classroom teacher is supposed to have a full-time assistant. But a 2016 change in state law has inadvertently opened the door to larger pre-K classes. The legislation, co-authored by Rep. Dennis Casey, waives financial penalties for school districts with accreditation deficiencies and was intended to ensure school districts received the maximum amount of state funding during tight funding times, Casey said. Instead, the law effectively relieved schools of abiding by many regulations. Some seized the opportunity to cut costs by increasing pre-K classes. Putnam City Schools, for instance, had as many as 23 pre-K students per class in the 2016-17 school year. It was too much, district administrator Barbara Crump said, and the district reduced the maximum to 22 for the upcoming school year. Broken Arrow Public Schools and Lawton Public Schools are also experimenting with larger pre-K classes. Other districts sheltered pre-K from rising class sizes, instead adding students in other grades and cutting costs elsewhere. The state’s two largest districts, Oklahoma City Public Schools and Tulsa Public Schools, maintained a 20-student limit in pre-K.
“With 4-year-olds who are very busy, who need lots of movement and activities, that one to ten (ratio) is for a good reason,” said Pam Hibbs, director of early childhood development for Oklahoma City schools. Research on class size doesn’t point to a magic number of students per teacher, but it does indicate smaller is better. Teachers and administrators tend to agree. And for parents, large classes are often a top complaint, school administrators say, and a reason for leaving the public school system altogether, surveys show. The importance of small classes is magnified in pre-K, where students are experiencing school for the first time and learning classroom procedures as well as foundational math and reading concepts. The youngest students also require more space because instead of rows of desks, classrooms are typically arranged with “centers” such as art, reading, computers, science and dramatic play. Students rotate through the activities during the day. The more students in a class, the more time the teacher spends just managing the classroom, transitioning from one activity to the next and helping students share and get along. That leaves less time for instruction. Reduced class sizes were a major tenet of Oklahoma’s Education Reform Act, or House Bill 1017, passed in 1990. Elementary classes were capped at 20 students and secondary teachers were limited to 140 students per day. The changes didn’t last. Within a few years, many districts were receiving an exemption to exceed the limits and eventually, the mandate was waived for all schools. At the time of HB 1017, Oklahoma’s pre-K was a pilot program in select districts. In 1998, Oklahoma became the second state to make the program free and available to all children. Most other states limit the program to low-income students. Pre-K is optional, but three-quarters of 4-year-olds attend, which is the third highest percentage in the country, according to the National Institute for Early Education Research at Rutgers University. Nationally, about one in three 4-year-olds attends preschool. Oklahoma’s pre-K receives high marks not just for access, but for its high-quality standards. An example is the requirement that all pre-K teachers be certified in early childhood education. National media have written about Oklahoma’s program, researchers have studied it and President Barack Obama praised the program in 2013. “(Early education) is one area where we are a leader,” State Board of Education member Cathryn Franks said recently. The program finds support in the Legislature as well as outside of politics. Billionaire oilman George Kaiser has invested millions in Tulsa’s Educare centers, a collaboration with the state to provide early education and other services. There are critics who say that state-funded pre-K programs are too expensive and the benefits don’t last. A five-year study by researchers at Vanderbilt University’s Peabody College found students who skipped pre-K caught up to their peers within a few years. In the National Institute for Early Education Research’s annual report on preschool around the country, Oklahoma met nine of 10 quality benchmarks and six of 10 more rigorous standards introduced by the institute in 2016. Both sets of standards include a class size of 20 or fewer and a child-to-staff ratio of 10 to 1 or lower. Those ratios are still on the books in Oklahoma but are now slipping away in practice. Salaries are a school district’s biggest expense, making small class sizes expensive to maintain. District leaders say they know larger classes aren’t what’s best for students or teachers, but it’s a matter of balancing their budgets. Putnam City Superintendent Fred Rhodes, for instance, announced in 2016 that the district’s pre-K classes would contain up to 23 students as part of a plan to cut $4.5 million in expenses. Class sizes went up in other grades, too: a maximum of 26 students in kindergarten through third grade, 27 students in fourth and fifth grades, and 28 students in sixth grade and up. In making the announcement, Rhodes expressed disappointment. “The state’s revenue failure is forcing school districts across the state to make significant cuts to their budgets, changing schools and classrooms from what they should be, for the good of students, to what they have to be in order to survive,” he wrote. The Putnam City district, in northwest Oklahoma City, served 19,000 students last year, including more than 1,100 in pre-K. Many districts that did not increase class sizes for pre-K did so for other grades. Both Oklahoma City and Tulsa public schools plan to slash costs next year in part by increasing class sizes. Other districts chose to cut elsewhere. When looking at his district’s budget, El Reno Superintendent Craig McVay said he’s reduced some areas to “bare bones” in order to protect the youngest students. The district of 2,700 students caps classes at 20 students in pre-K and 25 in kindergarten. Because the state requires students to be reading proficiently by third grade to move on to fourth grade, El Reno keep its classes small. The district started pre-K for 3-year-olds, too, a rarity in Oklahoma. “We have committed to build that foundational reading from a very early age,” he said. The caps on pre-K class size were relaxed last year under Senate Bill 933. The legislation placed a temporary moratorium on the penalties the state Education Department can assign to districts that receive deficiencies on their annual accreditations. Penalties involve reducing per-pupil state aid. Districts also can’t be denied accreditation during the moratorium. Class sizes are one of many items checked during accreditation. Others include safety drills, physical education requirements and board meeting rules. While the moratorium is in place, the Education Department says it is informally encouraging districts to maintain small pre-K class sizes. The moratorium will remain until the state funds schools at about $3,292 or more per average weighted student, a formula that assigns different dollar amounts depending on students’ grades and needs, such as students with disabilities. Funding is adjusted based on enrollment and revenue coming in. As of June 13, the funding level was $3,006. Casey, R-Morrison, said he hoped the proposal would demonstrate to lawmakers that schools need more funding to comply with all the mandates the Legislature imposes on them. Casey, a former teacher and superintendent, didn’t want to see schools’ state aid docked. The bill’s other author, Sen. Roger Thompson, R-Okemah, said they chose the dollar amount based on 2008 funding levels, when schools were more financially stable. Thompson, though, questions whether the state aid formula is the best way to fund the pre-K program or whether it should be more of a public-private partnership. He says he plans to file a bill in 2018 to address pre-K funding. Oklahoma is one of nine states that include pre-K in the state funding formula, according to the Education Commission of the States. Other sources for states are federal and local funds. 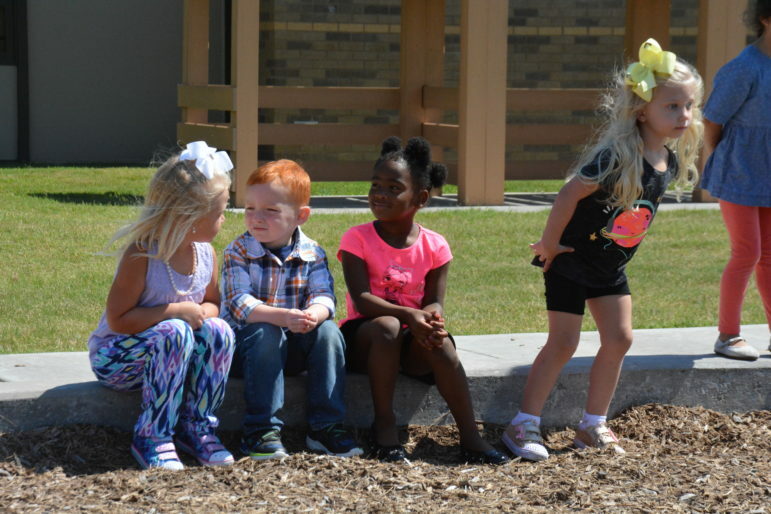 A group of Broken Arrow pre-K students play on the playground. Similarly, kindergarten classrooms need space for activity centers, and kindergarteners also benefit from small class sizes due to the individualized attention from teachers. For some kindergarten students, it is their first school experience and they are learning classroom procedures. Yet kindergarten teachers are less likely to have a classroom aide, like in pre-K. And kindergarten class sizes often are larger. Oklahoma Watch recently queried teachers in a Facebook group, and some kindergarten teachers said they had as many as 28 or 29 students last year. One Oklahoma City teacher reporting having over 30 kindergarten students at periods during the year when another teacher was out on leave. Oklahoma City Public Schools says its maximum is 26 in kindergarten, with an average of 22 students. In Tulsa Public Schools, elementary classes average 19 to 24 students. Broken Arrow set maximum class sizes for the upcoming year at 22 for pre-K and 24 for kindergarten. “We feel like we had to compromise, but we’re still protecting the classroom and we’re still protecting students’ ability to learn,” said Amanda Summers, a spokeswoman for the district. A landmark 1995 study of Tennessee children in K-3 found students performed better in reading and math in classes of 15 compared to those in classes of more than 20. The gains were higher for minority students. “The younger the child, the more important the class-size ratio,” said Steven Barnett, director of the Rutgers institute. Barnett attributed some of the importance to being able to provide individual attention to students and not have to spend instructional time dealing with classroom management. “What makes preschool work in terms of preparing kids to succeed in school is intentional teaching … The more kids you have, the less intentional you can be,” he said.